Hot, strong tea fuels the fishermen and farmers of Scotland. Take your tea or other beverage in this hardy stoneware mug, deep blue glaze emblazoned with the lion rampant and the legend "Scotland". Holds 16 oz. to the brim; microwave and dishwasher safe. Also available in red. Imported from UK. 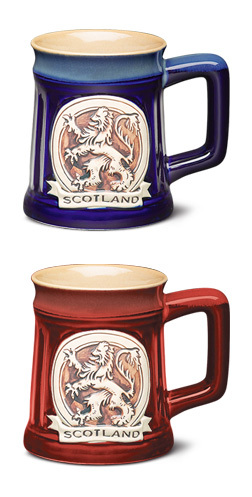 I ordered a set of Scotland lion coffee mugs.The couple that I presented them to, were delighted. My order arrived just in time for Christmas. To me, it looked too decorative to withstand use as a "real" coffee mug! My bad! Turns out this IS a great mug for my heavy use! It is heavy and has a high-gloss glaze on it, but do not fear! When you need to re-heat your Highland Grogg coffee or a mug of stout tea, into the microwave it goes! And emerges without toasting your fingertips! I would not fear to put it into the dishwasher on the top shelf, if I had one... This mug fulfilled all my Scottish morning dreams! Recently had a vacation in Scotland and couldn't find mugs that represent Scotland without being too touristy. I ordered both the the red and blue mugs from Gaelsong. They are just perfect! Love that they are stoneware. Not too heavy and not too light. Safe in the microwave and dishwasher too. Thank you Gaelsong!